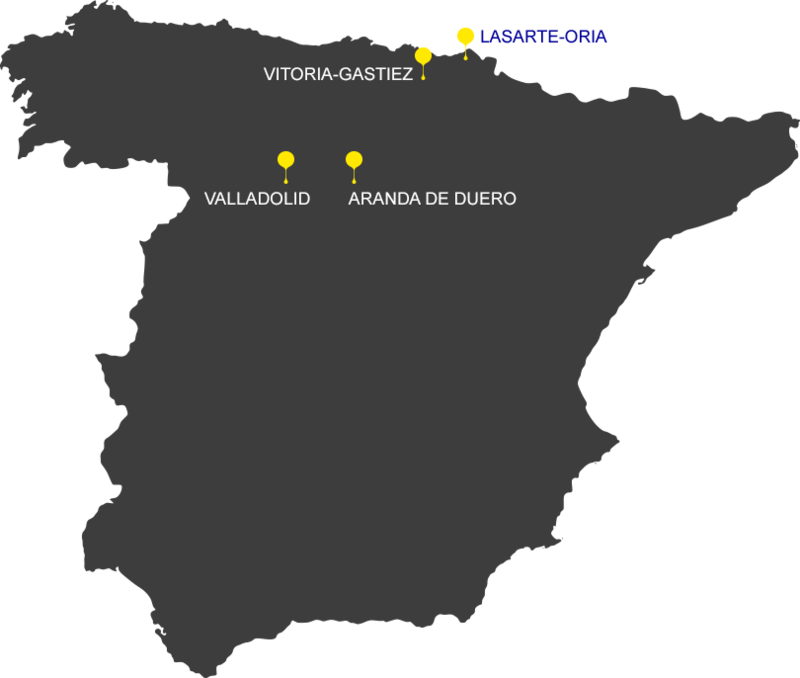 We provide support across four locations across Spain: Aranda de Duero, Valladolid, Lasarte-Oria and Vitoria-Gasteiz. This town of approximately 32,000 people is located close to the main road network links from Barcelona and Madrid to Portugal. Its location at the juncture of these routes has led to Aranda de Duero acquiring a growing recognition as a business centre. The offer of industrial units at competitive prices and an airport nearby Valladolid makes this an ideal logistical location for accessing the markets of central Spain. This large city of over 300,000 inhabitants benefits from all the facilities one would expect from the capital of the region of Castile and Leon. This bustling city with its high presence of major automotive companies has a prime geographical location and an excellent transport network, and is 50 minutes from Madrid by TGV. This small town benefits from being situated only 5km from the busy coastal city of San Sebastián and close to the French border. The region, which offers well established traditional industries, is an ideal location for businesses wanting to target the regions of northern Spain and/or south western France. Strategically placed in the north of Spain, some 80km south of the port of Bilbao, this city of 200,000 people has excellent rail and air services. Main industries include automotive, sugar production and the manufacture of furniture, and there are also a good number of industrial units on offer.